OnePlus 3 and 3T are finally being updated to Oxygen OS 4.1.7. The OTA update brings several improvements like system fluidity, Bluetooth optimization, Battery improvements, etc. The most important and highly anticipated feature was the August 2017 Security Patch update. Although, its still based on Android 7.1.1 Nougat and not the Android v7.1.2, it does bring the latest security patch to the OnePlus 3/3T which fixes several vulnerabilities. Google launched the official stable Android 8.0 Oreo for Nexus and Pixel device along with teh system images. OnePlus 3 and 3T are sure going to receive the Android 8.0 update, but it will be long before its actually official. First the users will receive Open Beta and then the official stable Oxygen OS shall be released. Once the OnePus 3 devices receive Android 8.0 Oreo, the Open Beta for the OnePlus 5 will start. 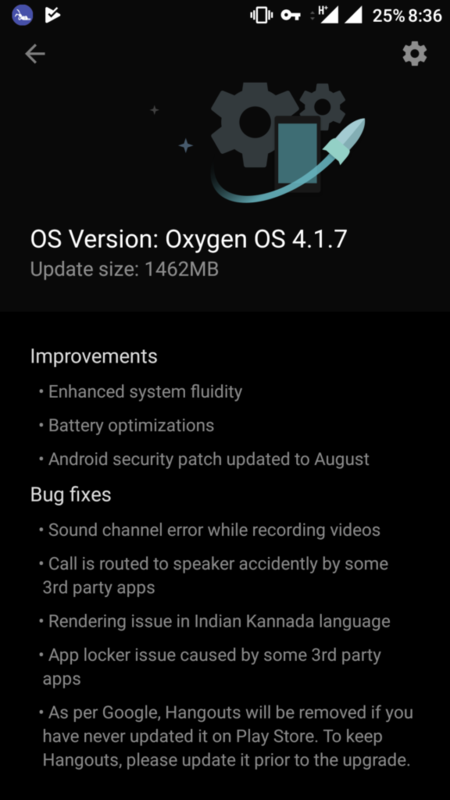 Today’s Oxygen OS 4.1.7 also fixes several bugs. This includes audio channel while recording videos, App locker issue, calling issues, sceeen turning off by third party intrusion. Lastly, the Hangouts app is about to die. Google is asking manufacturers to discontinue support of Hangouts. As requested by Google, Hangouts will be removed if you have never updated it on Play Store. To keep Hangouts, please update it prior to the upgrade. The OTA is currently live in regions and countries like Canada and Germany. This brings us to the next question. How to download OTA update? The answer is simple. Install a VPN app like Opera VPN from Play store. Change the location to Germany or Canada. Check for OTA updates. Download the Oxygen OS 4.1.7 from the OTA notification. Finally, tap to install. See the full tutorial from previous Oxygen OS 4.1.6 for OnePlus 3/3T. Alternatively, you can simply download the full signed firmware zip from above (once its available) and do a Local upgrade. Read: How to flash full stock firmware onto OnePlus 3/3T?